(CNN) – Can you blame him? In a rare admission by a politician, Massachusetts Gov. 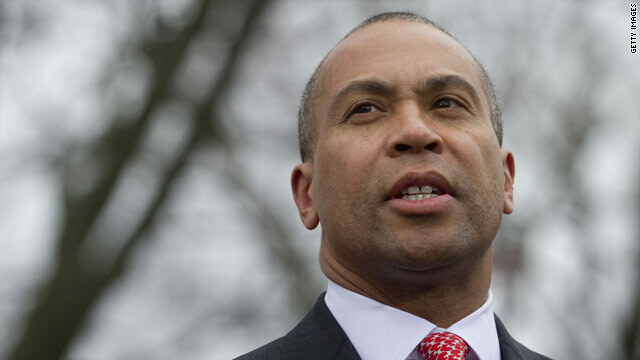 Deval Patrick said he got "quite drunk" the night after suspected Boston Marathon bomber Dzhokhar Tsarnaev was captured at the end of a dramatic, daylong manhunt. Speaking to employees at a Cambridge marketing firm this week, the Democrat opened up about the aftermath of the terror attack, saying he was relieved not only that Tsarnaev was captured but because he could fully do away with the city's lockdown. "The reason why it worked out in the end is because we found him. If we didn't find him then people would be bitching and moaning about how we kept them indoors all day," Patrick said, according to the Boston Herald. Residents in Boston and certain surrounding areas were ordered to "shelter in place" for 16 hours as authorities searched for Tsarnaev. Patrick said he began facing pressure–even from the White House–later in the day to remove the restrictions. "'What are you going to do about the city? You can't keep it locked down indefinitely'," President Barack Obama told Patrick on the phone, the governor said. They decided to end the lockdown Friday evening after finishing the door-to-door search. That same night, Tsarnaev was found in a boat on someone's property and taken into custody. Patrick, who's considered a rising star in the Democratic Party, said the next day he traveled to his rural home in the Berkshires and went for a quick swim, then headed to a local restaurant alone with a book. The owner asked him if wanted to be near people or away from them. "As far away as I can," he told her, recounting the story. He said the waitress started bringing him celebratory drinks. "And by the end of the meal, I was actually quite drunk, by myself." The Boston Herald talked to the restaurant's co-owner, Maggie Merelle, who told the paper that she didn't sense the governor was intoxicated. "He wasn't tipsy. I never would have known," Merelle said, adding that he had a "glass of chardonnay or two" with his meal. Patrick also said he left without paying the bill, according to the Herald. "I realized I had no money with me. So I called her over, and I said to Maggie: 'I really appreciate it. I'm very relaxed.' And I also have no money. Can I bring it down tomorrow or something?' "
Merelle told the Herald the governor later paid his tab. Did the Governor drive himself home? No fan of Patrick or his party but this sort of candid admission is actually refreshing. He actually comes of as a normal guy! I like Devall, but if he was any regular Joe Blow, he would've been in the kitchen scrubbing pots and pans. I'm just saying. what kind of stupid story is this? so...he went to the restaurant alone...got drunk and left? no driver?...he drove home "quite drunk"...nice....I'm sure the public will be glad to hear that. Residents in Boston and certain surrounding areas were ordered to "shelter in place" for 16 hours as authorities searched for Tsarnaev. not accurate. the very restrictive gun laws in massachusetts made this a "cower in place" order. Not a crime at all... But do not drink nor smoke. They are bad. No he didn't drive his auto home. He took a busn which was waved past several check points. The next morning he woke up with the bus in the driveway and he wondered how it got there since he had no idea of how to drive a bus. Nope, he swam. it says he went for swim, stopped for a bite to eat, and had no money on him. Sounds like he was still wearing swim trunks. Amen Deval...Its refreshing in the current political climate to hear a guy tell the truth without regard for political repercussions. He is a regular dude who talked about dealing with an enormous situation. So he had a coupla belts to take the edge off...so what? As a governor he has a driver and security detail. He put no one at risk. He sat in a booth with a book and quietly blew off a little steam. Our leaders are best when not pretending to be perfect – but submitting to being human. Rising star in the democratic party? Take it from someone who lives in The People's Republic of Massachusetts – if this chump is a "rising star in the democratic party", then the future is very bright for the GOP. You people. Give this guy a break. He has shown good judgment so far and honest to. How rare. I do not like Devall or his politics. The only reason he may be considered a rising star by some is because the stupid people of MA voted for him again. My biggest pet peeve is he is willing to give hard earned taxpayer money away to illegals. Refreshingly honest. I like Gov. Patrick and I can see him as a contender for POTUS in a few more years..
Chardonay? Hell I would who have had a fifth of Canadian Wiskey after that ordeal! I find his openness refreshing. And bonus points for being honest and paying up his tab. If I were Coupe DeVal I would STAY drunk. Got drunk? Had no money? Rising star? What? Did he go to the mens room at all? 1 or 2? If 2, how many sheets of paper did he use? He wipe once or twice? That information has to be as important as anything in this article. Great job CNN. A true rising star in the democrat party. Not a fan of the governor, but good for him. A little of that can be beneficial if you are responsible about it. Duval is good people. He's smart and down to earth. Let's just hope he doesn't let himself be corrupted by politics.